Even under the stress of infusion, the leaves of this Tai Ping Hou Kui maintain their whole shape and deep green color — a fascinating tea to look at as well as drink. 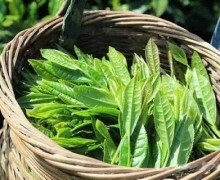 This famous green tea from the town of Tai Ping was invented in the early 1900’s. This is an incredibly unique tea made by a complicated and time-consuming process. 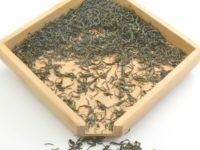 Even though Tai Ping Hou Kui was invented relatively recently, it has quickly become well regarded in China, regularly appearing on lists of the country’s most prestigious teas. As with many famous teas, Tai Ping Hou Kui is named after its place of origin. Tai Ping County sits northeast of the Huang Shan Mountain range. Even though the county resides in a mountainous region, the tea’s production area is not very high above sea level (only about 300 meters). There are two local myths associated with Tai Ping Hou Kui: The first is a legend about a benevolent flock of birds who carried the first tea seeds into Tai Ping County, scattering them amongst hills and crags where they would sprout. When these bushes began growing in and the villagers realized it would be too dangerous to pick. The villagers took local monkeys and hung cloth bags around their necks and sent them up the cliffs to pick the tea. While this is a wonderful idea to entertain, we can assure you no monkeys were used to pick this tea! The second legend also tells of the monkeys of Tai Ping. As this story is told, when a mother monkey died of grief after loosing her child, a local farmer kindly buried the animal on his land. The farmer soon dreamt of the monkey guiding him to a place, deep in the forest, where a tea garden was. Upon awaking, he retraced his dreaming steps to verily discover a hidden garden of tea bushes which he plucked to make this tea. Tai Ping Hou Kui’s picking begins around April 20th, during Gu Yu solar period of China’s traditional agricultural calendar. The plucked leaves adhere to a standard of sprigs of one bud with three open leaves. Farmers must wait slightly longer than is normal for other early spring tea, because Tai Ping Hou Kui relatively large sprigs take longer to fully develop. This particular lot of Hou Kui was specifically chosen from the earliest picking in the season, when the flavor of the leaves is at its softest. Many Hou Kui on the market today are made from the more abundant summer harvests. Tea picked in the summer, though less expensive, can have a very heavy flavor, lacking the traditional lightness Hou Kui is known for. Once the producers return from the fields to their workshop, they sort the tea by plucking off the oldest leaf on the sprig, further refining the picking standard. During this process, fresh leaves also get a chance to rest and wither for a while, making them more pliable for processing. 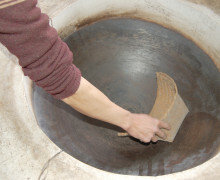 Tea makers use an iron metal wok with a diameter of about 70cm wide and about 35-40cm deep. They only fry 100 grams of fresh leaves at a time at 110C, constantly moving the leaves in the wok for about three minutes at a time. This heat denatures the enzymes in the leaf that cause oxidation (darkening), thus allowing the leaves to remain fresh and green in color, flavor, and aroma. This step is know as “sha qing” (lit. “kill green”). Next, to begin shaping the leaves, producers drop the temperature of the wok and fry the leaves for a couple more minutes using very complicated hand movements, squeezing the buds and leaves together. The tea leaves become very soft at this stage. After this, the tea is roasted in a wooden four-drawer cabinet-like structure, with a charcoal pot underneath. 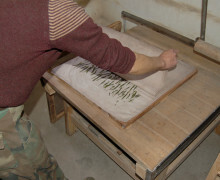 Workers carefully adjust the charcoal to make each level of the cabinet a different temperature: the first level at 100 C, the second at 90 C, the third at 80C, and the fourth at 70 C. Batches of leaves are moved between levels of the cabinet, removing their moisture with different levels of heat. The roasting process takes about an hour. 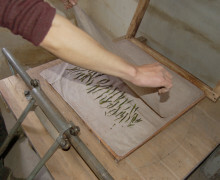 Once leaves finish this staggered roasting, workers lay out each leaf flat and press them into their distinct “bookmark” shape using two layers of fine steel screens. Originally, before these steel screens had been invented, Tai Ping Hou Kui makers used sheets of thick paper and the pressure of their hands to press each leaf flat. Finally, after roasting and shaping, the leaves are allowed to cool down for a few hours before they are consolidated into large batches and roasted one final time to reduce their moisture content to a stable level. After the final roast, tea makers will wrap the finished Tai Ping Hou Kui in cloth or paper and place it in a big ceramic pot. The ceramic pot has limestone at its bottom to absorb moisture. The leaves rest over the limestone, upon a wooden plank padded with large bamboo leaves. A short rest in this traditional storage is the final and most subtle step in Tai Ping Hou Kui’s production. As the leaves rest in this container, they are imbued with the gentle aroma of the Tai Ping County’s bamboo. 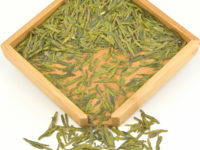 Tai Ping Hou Kui’s infusion is shows good clarity with a brilliant green color. 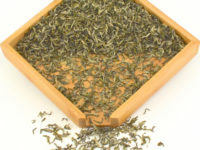 Even if over-steeped or too many leaves are used in its infusion, Tai Ping Hou Kui will never bitter. The tea’s gentle floral aroma persists over multiple infusions. The taste is fresh with distinctive with notes of toasted bamboo leaf. Tai Ping Hou Kui organic green tea is best enjoyed in a tall glass, allowing you to appreciate the beautiful shape of the leaf as you drink. Even under the stress of infusion, the leaves of this Tai Ping Hou Kui maintain their whole shape and deep green color — a fascinating tea to look at as well as drink. Tai Ping Hou Kui village, plum blossoms are blooming in early spring. A deep wok is used to fry Tai ping hou kui leaves. Transferring the cloth to a steel mesh board. Another piece of cloth is used to cover the tea leaves. 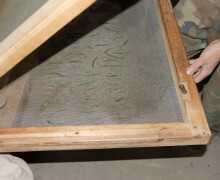 A a steel mesh board is placed on top of the cotton cloth. Opening the steel mesh and cotton cloth after pressing the tai ping hou kui. The cotton cloth is removed, just the tea leaves are left on the steel mesh. Two steel mesh boards grip the leaves to make the tai ping hou kui shape stable. The two steel mesh boards are put inside the wood oven to bake. Infusion: First infusion at least 1 minute. The leaves are good for at least 5 infusions.